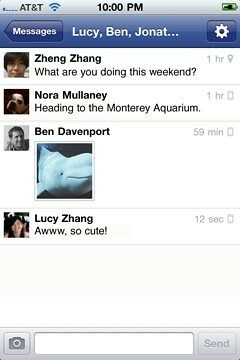 Facebook has released Facebook Messenger which is an extension of Facebook’s Messages service and will allow you to send a text message to your phone’s contacts and a Facebook message to your Facebook contacts. Bonus: You get to send pictures as well. The app obviously competes with Apple’s iMessage, Blackberry messenger and all of the other silo-ed messaging apps out there but with a user base of 700 million+, it is well positioned to be a contender. Messenger is available in both the iTunes App Store and Android Market and is based off the Beluga technology which the company recently acquired. With all the Google+ noise of late we’ve forgotten about Facebook’s assault on mobile. They’re back. Update: Oh, and there is video conferencing hidden in the app.